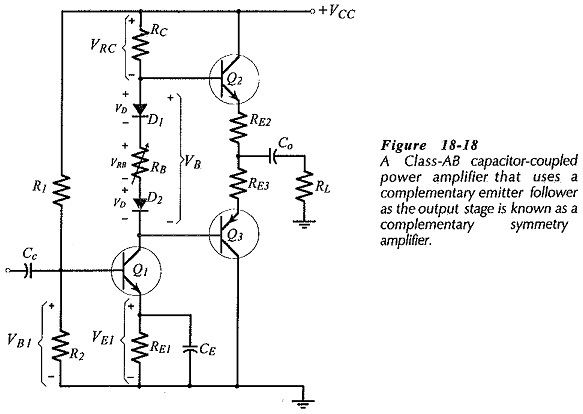 The basic circuit of a Class-AB amplifier using a complementary emitter follower output stage and a Capacitor Coupled Class AB Output Stage load is shown in Fig. 18-18. The circuit is termed a complementary symmetry amplifier. Transistor Q1 and resistors R1, R2, RC, and RE1 comprise a common emitter amplifier stage that produces all of the circuit voltage gain. The output of Q1 is developed across RC and applied to the bases of Q2 and Q3. Capacitor Co ac couples RL, and dc isolates RL to keep it from affecting the circuit bias conditions. The total voltage drop (VB) across diodes D1 and D2 and resistor RB forward biases the base-emitter junctions of Q2 and Q3 to avoid cross-over distortion. Emitter resistors RE2 and RE3 help limit the quiescent current through Q2 and Q3. Adjustment of the bias voltage (VB) is provided by variable resistor RB. The diodes have voltage drops (VD) that approximately match the, output transistor VBE levels. Also, VD does not change significantly when the diode current changes, so, the diodes behave like bypassed resistors. The diodes and output transistors can be thermally-coupled by mounting D1 and Q2 on a single heat sink, and D2 and Q3 on a single heat sink. In this case, VD follows the VBE level changes with temperature, thus stabilizing the transistor bias conditions over a wide temperature range. The junction of RE2 and RE3 must be biased to VCC/2, so that the output voltage to Co can swing by equal amounts in positive- and negative-going directions. 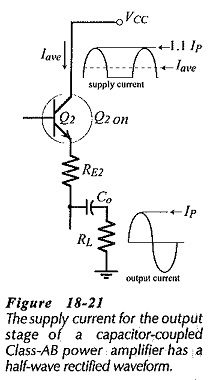 Design of the type of circuit shown in Fig. 18-18 is largely a matter of selecting appropriate resistor voltage drops and current levels, and then applying Ohm’s law to calculate the resistor values. 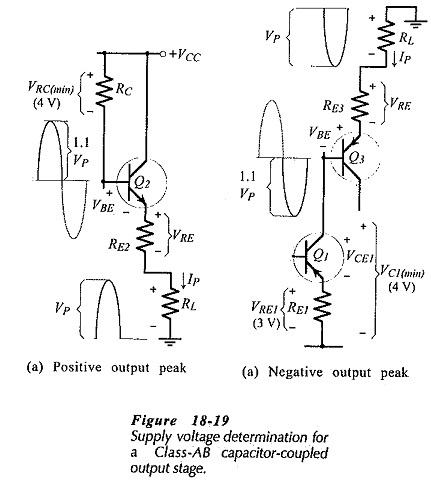 The peak output voltage (VP) and peak output current (IP) can be determined from earlier Equations, respectively. Those equations were developed for the power delivered to a transformer primary, but they apply equally to power delivered to any load resistor. It should be remembered that RE2 and RE3 are included to help stabilize the transistor quiescent currents at a level that eliminates cross-over distortion in the output waveform. For the type of amplifier circuit in Fig. 18-18, without overall negative feedback, it is best to select the emitter resistors as large as possible. Smaller emitter resistors can be used in circuits with dc and ac negative feedback. The minimum current through (IRC(min)) should typically be selected 1 mA larger than the peak base current for the output transistors. RC is calculated from VRC(min) and IRC(min). The resistance of RB is now calculated from VRC(dc) and ICQ1. Resistors R1, R2, and RE1 are determined in the usual manner for an emitter current bias circuit. The output transistors should be specified in terms of their maximum voltage, current, and power dissipation. The maximum VCE for Q2 and Q3 (in Fig. 18-18) is the total supply voltage (VCC). Maximum current for Q2 and Q3 is the peak load current plus the selected quiescent current (IQ23). This normally 1.1 Ip. Transistor power dissipation is calculated by determining the dc power delivered to the output stage from the power supply, and then subtracting the ac load power. The remainder is halved to find the power dissipated in each transistor. Equation 18-12 applies; PT = 0.5 (Pi – Po). Recall that the transistors must be operated within the safe operating area of the characteristics. Most power amplifiers typically have RL = 8 Ω or 16 Ω. So, the load-coupling capacitor normally sets the circuit low 3 dB frequency.